One year and one week ago, Uhuru Kenyatta was sworn in as the new president of Kenya. In early March 2013, largely peaceful elections were held. I have myself been in Eldoret, in the northern Rift Valley, for one week during the times of the elections and I was a “local” election observer with the VUP Foundation. The talk of the time were about sanctions as Western governments, particularly the UK, threatened that they might impose some sort of sanctions against a Kenyan government that would include the ICC suspects Kenyatta as well as his running mate, vice-president William Ruto. On 4 March 2013, general elections took place in Kenya. In a very complex process, Kenyan voters had to fill out six different votes at a time. Surely something a lot of voters in the Western world would have not been able to cope with. In general the country was very well prepared for the elections. A return to the post-election chaos of 2007/8 was important to be avoided. The only major challenge was the technical equipment used. Almost all polling stations that I visited had very long queues because instead of computers, the clerks had to rely on books and consequently it took much longer than expected. However, voters were patient and were full of motivation to cast their vote. some The process to get to know the results was quite difficult though. Originally, all the information from the polling centers were transmitted electronically. However, the system broke down and therefore all the voting boxes had to be sent physically to Nairobi. Therefore, it took the Independent Electoral and Boundaries Commission six days to announce the official result. In the end, Kenyatta was able to achieve 50.07%, just enough to avoid a run-off. This came as a surprise for those who believed the opinion polls. According to the polling information, clearly a second round seemed to be necessary as both Kenyatta as well as his rival Raila Odinga would gain about 45% each. Quite some people feared that chaos would break out another time and Odinga’s followers would riot. However, Odinga played a crucial role to take the legal route instead of mass protests that would block the streets and cause violence. However, Odinga’s claim did not hold water and was rejected by the Supreme Court on 30 March 2013. That made the road clear for Kenyatta for the first transition ever in Kenya’s history that was peaceful and the former president, Mwai Kibaki, stepped down within his term limits. 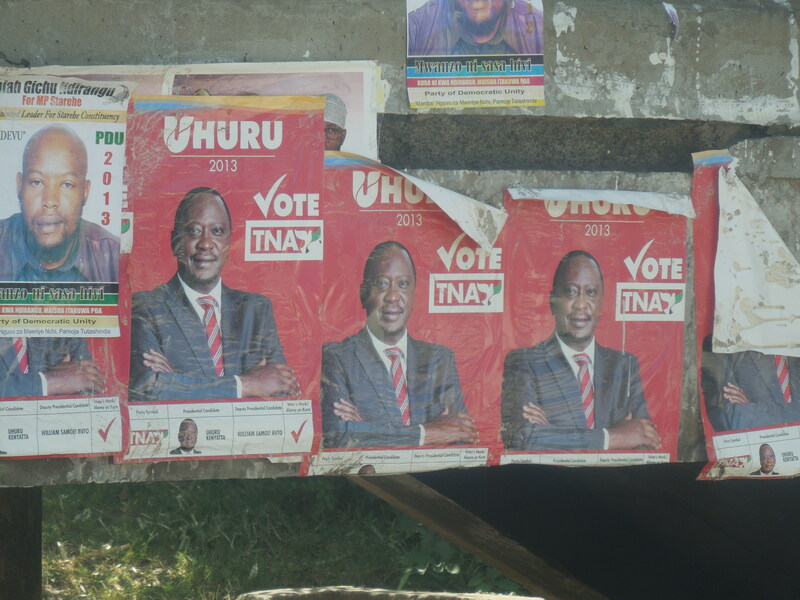 Already before the vote, many Kenyans told me that the result would be clear. It was a sheer exercise of numbers. Kenyatta is coming from the Kikuyu ethnic community with some 22% of the population and Ruto from the Kalenjin community with some 14%. In addition, some other smaller communities would help them to get to about 40% of the electorate. Furthermore, Odinga was not able to convince his followers in his heart land in Western to register for the elections – in the stark contrast of Kikuyu land were an enormous mobilization took place to make sure that basically all eligible voter would get a registration card as well. Therefore, for quite some people the result of the presidential election was already clear before the elections took place. Nonetheless, it came somewhat as a surprise to me that independent candidates that are not linked with corruption like Peter Kenneth (0.59%) or bring a new style to politics, like Martha Karau (0.34%) were so weak in their results – as if they were not even running. However, these elections confirmed that politics in Kenya is still very much linked to ethnicity. The country still needs to develop a step further to overcome the issue of ethnicity and vote according to performance of a politician. It can be noted that nothing of the threats of Western powers about sanctions against the Kenyan government were coming into reality. Thus, the Western strategy to influence Kenyan voters backfired and helped Kenyatta to get into power. Naturally, Kenyatta himself praised his first year of office. Electricity will become more affordable, he said in a speech, something crucial in a country that is experiencing power cuts on a constant basis. He also would continue devolution, also an important point as Kenya has been characterized by a strongly centralized system. With the new constitution, the regions should get more powerful, decisions should be taken closer to the citizens and thus increase accountability. Moreover, a couple of grand infrastructure projects are in place, including the port in Lamu, the national airport in Nairobi and the railways between Mombasa and Nairobi. Importantly for him, Kenyatta does not need to fear the ICC anymore; his case basically has broken down, not least because of witness imitation. The achievements during the first year are not particularly impressive. The main electoral promise, free laptops for all standard one students has not been mentioned a single time. Clearly, a promise that could not be uphold. The security threat in the country seems to be bigger than beforehand with the Westgate attack and the current round-up of Somalis and Kenyans who are ethnic Somalis who are detained on an ethnic basis in stadiums or beaten up. It does not help there that an ethnic Somali woman is foreign minister of the country. The behavior of security forces will continue to divide the nation instead of providing peaceful relations. A land reform seems to be as far away as ever, although it would be of huge importance for the people. Overall, Kenyatta’s performance seems to have been a bad one, at best mediocre. However, he has not caused the problems that some had feared before he took office due to challenges with the ICC. In short, Kenyans do not gain a lot thanks to their new government. To get a government that will work for the people, the mwaninchi, Kenyan citizens need to elect their politicians according to their performance and not according to their ethnicity.